Group Purchasing Network (GPO) that allows our members access to favorable pricing and tiering on things medical practices use all the time – like medical and surgical supplies, communications, office supplies, shipping, and more. Advisory services that find business efficiencies in health care operations by providing valuations, integration and management, operational reviews and consulting, change management and implementation support. Temporary or permanent leadership support for clients needing executive level expertise on their team or Board of Directors. Trusted advisory services that help smaller provider groups create, charter and manage key alliances in the industry, drive committee work, serve as expert speakers and panelists, and provide leadership within key industry groups. 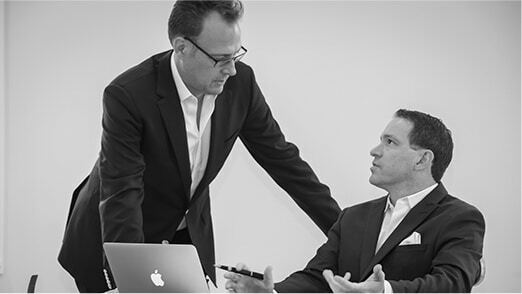 Jeff serves as Blackmaple Group’s senior strategist and chairs the board of directors, managing key customer accounts and plotting strategy for clients and the company. Prior to founding BMG, he spent more than 25 years in senior executive positions with hospitals, medical billing companies and physician group practices in both the USA and Canada. A finance specialist by training, Jeff is a nationally recognized expert on medical billing, contract adjudication, healthcare financial management, and distressed asset turnaround including reorganization and bankruptcy. He’s also a Certified Six Sigma Black Belt and Project Management Professional. Marc is known for his impressive ability to guide large-scale change, driving reorganizations, new partnerships, major implementations, and mergers and acquisitions. He was also instrumental in building Blackmaple Group Purchasing Solutions, where he continues to focus on member engagement, supplier relationships and best practices for members to maximize savings. A renowned speaker and facilitator, Marc is often called upon to address teams during retreats. Prior to joining BMG, he served as Senior Vice President with Capital One Bank, and has worked in the USA, Canada and the EU. John A. Burigo, M.D. FACOG is board certified in Obstetrics and Gynecology and practices at OB/GYN Specialists of the Palm Beaches, PA, at the Palm Beach Gardens location in Southern Florida. Dr. Burigo has been practicing medicine since 1980 and accomplished much of his education in the state of New York. He received his M.D. degree at New York Medical College and completed his OB/GYN residency at Albert Einstein College of Medicine. In addition to his many medical achievements, Dr. Burigo has also served as both President and board member of the Florida Obstetrics and Gynecology Society (now known as ACOG District XII) and as a board member for the Florida Neurologic Injury Compensation Association (NICA). His practice is also a strong supporter of the Komen Breast Cancer Foundation and Healthy Mother’s/Healthy Babies of Palm Beach County.